Who is it for? 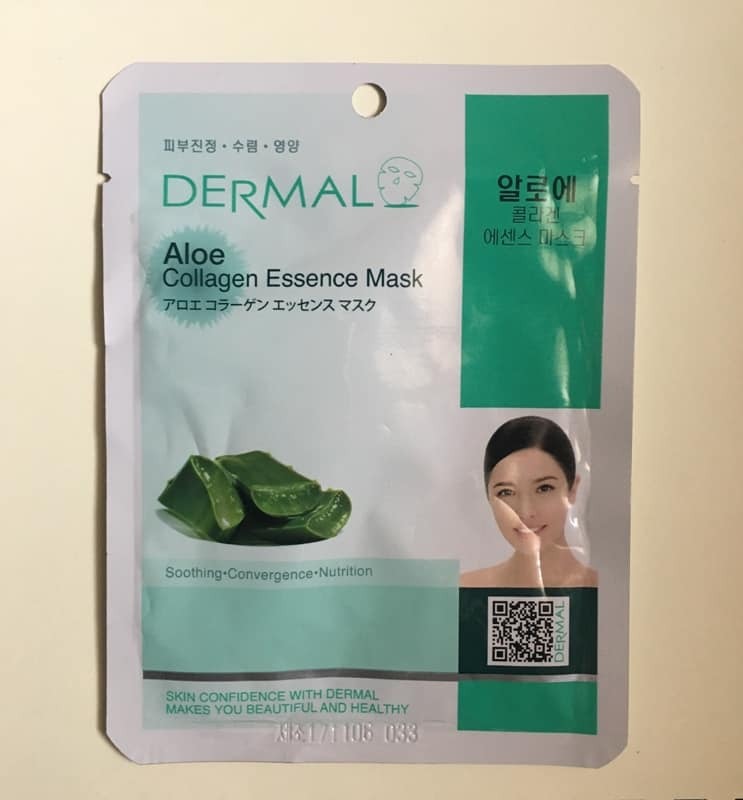 Dermal Aloe Collagen Essence Mask is for all those looking for a sheet mask to revitalize and soothe the skin with the astringent-like effects of aloe extracts. INR 145/- for one sheet mask (23g). Cleanse and tone the face. Take out the mask sheet from the pack and unfold it. First, gently apply the mask sheet around your eye part and then fit your facial contours. Leave on for 15-20 minutes. Peel off the mask sheet and tab the remaining collagen essence over your face until it completely absorbs to your skin. Avoid using on irritated or sunburned skin by direct sunlight or on troubled skin part including eczema or dermatitis. Stop using if skin becomes itchy, red, swollen etc during or after use. This sheet mask comes in a shiny white packaging which is pretty sleek. The name and a picture representing aloe vera plant leaves can be seen on the front of the packaging. Detailed instruction can be found on the back of the packet. The fragrance is plant-like and fades after a while. The color of the sheet is white but the serum is clear. The mask is made of tissue which contains the gel like a serum. It is better to place it on the face soon after unpacking. The sheet feels heavy with essence but doesn’t really drip. The sheet mask feels pretty well soaked in gel-like serum which is a bit thick as opposed to the sheet masks with water like a serum and thus the mask doesn’t really dry out completely. The hands get smeared with serum while applying the mask so I apply that on my neck and hands. The fit is good but it doesn’t cover the complete nose area. This particular sheet mask has Aloe extracts and thus the name has ‘Aloe’ in it. Aloe is known to soothe and moisturize the dried out skin from daily life and keeps it clean and smooth. Once you remove the mask and dab the skin, the serum gets absorbed into the skin a little more. However, when you touch the skin a slight stickiness can be felt. One may wipe the skin with cotton lightly if the serum feels to be in excess. There is a visibly clear skin with a brightness and suppleness to it. I have combination skin and acne but did not feel any sort of irritation or further breakouts. Like all the other sheet masks from this range, this one also has collagen and vitamin E which gives elasticity and nutrition to the skin. All said I felt that the effect of the mask stays for a day or two and thus using it regularly is advisable for long-term results. Contains collagen that firms the skin. Added benefits of vitamin E.
Doesn’t irritate or aggravate acne. Fit could be better around the nose area. The skin feels a little sticky when touched. The effect stays for a day or two only. Cost is higher as compared to another sheet mask of different brands. Yes, I would repurchase it because I felt a clear difference in my skin after using it. I feel that regular use of these masks will give better results. Dermal Collagen Q10 Mask – Yes No ?